In December 2001, Salvador Cathedral (popularly, La Seo), in Zaragoza was declared a World of Heritage site by UNESCO as one of the most representative Mudéjar architecture of Aragón. Besides, this remarkable Cathedral has more than enough artworks to be a must-see place. Therefore, La Seo del Salvador welcomes visitors from all over of the world who want to explore its interesting Cathedral. 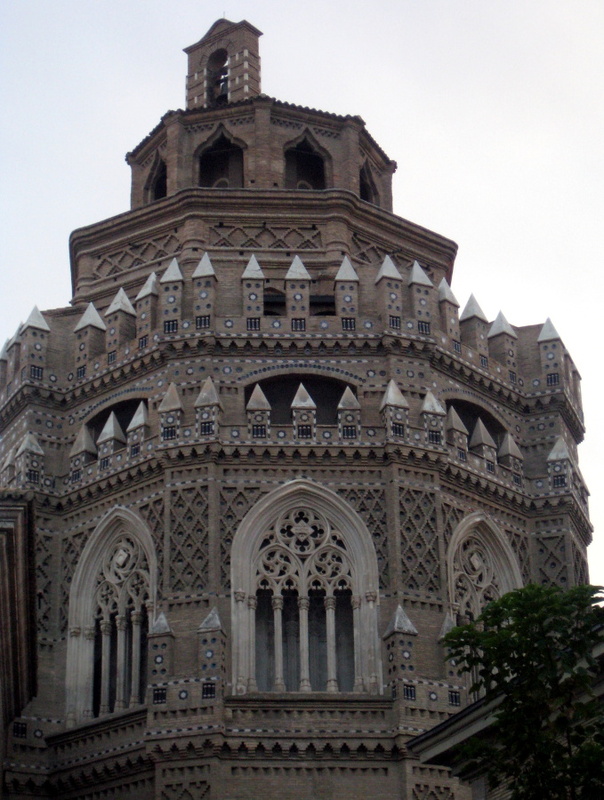 Salvador Cathedral in Saragossa (Catedral del Salvador de Zaragoza) commonly called La Seo, was built on the site of the great mosque aljama of Saraqusta (Saragossa) between 12th and 16th centuries. Being rebuilt, reformed, improved and widened during these centuries, the present Cathedral has Romanesque, Mudéjar, Gothic, Baroque architectural styles which can really be seen outside the Cathedral, although its most important treasures are inside La Seo del Salvador. On the 18th December 1118, Alfonso I of Aragón known as The Batallador (1073-1134 ) conquered Saragossa and the Mezquita Blanca ( White Mosque) of Saraqusta (Saragossa), which had been built in the 8th century by the Muslims, was converted into the first Cathedral in Saragossa. During the 12th century a new Romanesque building of three naves was constructed on part of the mosque, and the minaret of the mosque was converted into the bell tower of Salvador Cathedral. However, only two beautiful Romanesque apses remain as a symbol of that temple currently. In 1318 the diocese of Saragossa became archdiocese and Don Pedro López de Luna who was the first archbishop of Saragossa ordered to built the new Mudéjar Cathedral on part of the old mosque and of the dark Romanesque building, In fact, some interesting remains of this building can be seen in La Seo, By the way, it is said that the minaret of the mosque is covered by the current baroque bell tower and the west facade of the Mudéjar building is behind of the present baroque facade. 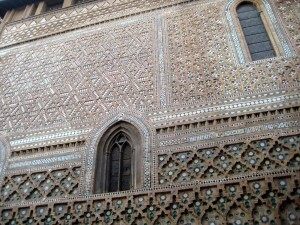 Don Lope Fernandez de Luna archbishop of Saragossa, who was a significant benefactor of the Aragonese Mudéjar art, ordered to build the first dome of the Cathedral and the San Miguel Chapel also known as the Parroquieta in Mudéjar style. 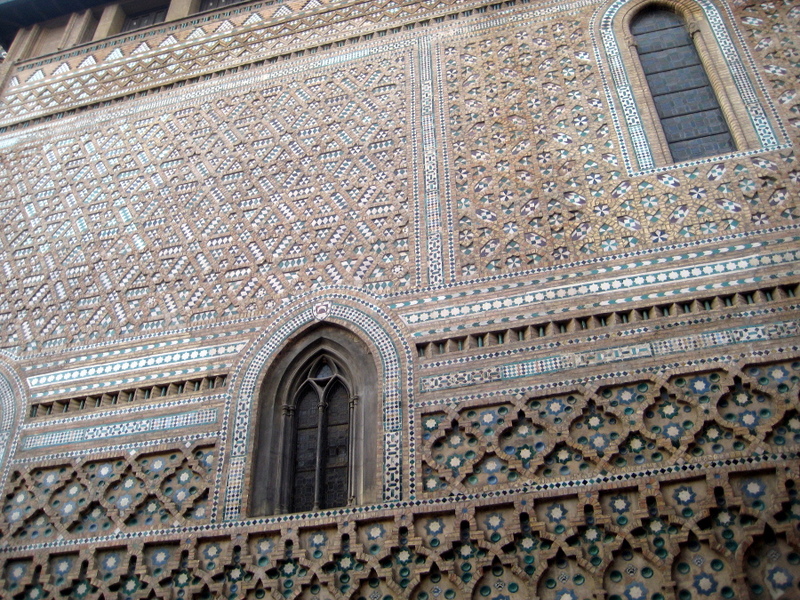 Situating next to La Seo and of its apses the Parroquieta was built between 1374 and 1381, and its outstanding north wall was decorated with rajolas (bricks), aljez (gypsum), colorful glassed ceramic tiles and colorful aliceres (tiny pieces of tiles) in its finer Mudéjar art . Inside the chapel is the beautiful tomb of Don Lope Fernandez de Luna, its unbelievable wooden techumbre (ceiling), its original arrimadero (ceramic tiles on its walls) and its crypt. It is worth a visit. Don Pedro Martinez de Luna, Benedico XIII also known as el Papa Luna (Pope Benedict XIII) (1328- 1423) was other great benefactor of the Mudéjar art in the Cathedral and ordered Mahoma Rami, a renown architect and prestigious maestro, to built the second dome in La Seo because the first one had been knocked down. Unfortunately this second dome was also knocked down and the current dome was built in 16th century in Mudéjar style in a way very similar to the second one. Don Alonso de Aragón, archbishop of Saragossa (1470-1520) ( son of king Fernando II of Aragón 1452-1516) was other great benefactor of the Cathedral, he added two naves to La Seo among other many things. Don Hernando de Aragón archbishop of Saragossa (1498-1575) (son of Alonso de Aragón and grandson of King Fernando II) ,who was other significant benefactor of La Seo Cathedral, ordered to built the impressive San Bernardo chapel between 1550 and 1557 a masterpiece where are the tombs of Don Hernando and his mother. Do not leave La Seo without staring this chapel carefully. Nowadays, inside La Seo visitors will be spellbound when they can see in the main nave the magnificent Gothic altarpiece, a masterpiece of alabaster that is considered to be the best of Europe. Its sculptural artwork was begun about 1434 and took about 50 years to made it. Visitors can not miss out on this chance. Visitors should not leave La Seo without seeing the choir stalls, the organ, Saint Bruno and Virgen Blanca chapels among other things. On the other hand, La Seo has been witnessed of many important events in the life of Aragón. Besides, La Seo was the coronation Cathedral since 12th to 16th centuries, and has been the final resting place for many archbishops and special people for years. Taking a stroll along Saint Bruno square bordering La Seo, walkers can enjoy the stunning Mudéjar wall and apses, besides, they can also see and discover the interesting Dean arch and other interesting buildings. People interested in culture should visit the Tapestries museum (Museo de Tapices) which is considered to be unique in the world, the tapestries date between 14th and 17th centuries. 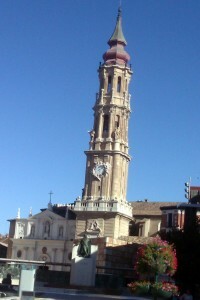 In La Seo Square is also the Diocesano museum a interesting way to know the religious art. Both museums are worth a visit. Perhaps, people would like to visit the Foro museum in the same square, it is about history and Roman ancient time in Saragossa. By the way, La Seo is located in the Cathedrals square or in La Seo Square (the Seo square and the Pilar square both of them are joined together, so it is also called the Cathedrals square) is the first Cathedral of Saragossa with five naves because the Pilar Cathedral of three naves is the second Cathedral of Saragossa. To add, the tickets to visit La Seo are very cheap. 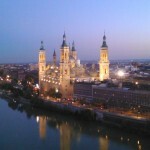 – Pilar Square and Pilar Cathedral: The Pilar Cathedral (Basilica del Pilar) is the most famous icon of Zaragoza. 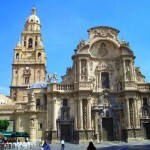 This cathedral is placed in the centre of the city, near the Ebro river and in the same square than “La Seo” Cathedral. 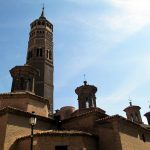 – La Aljafería (The Aljafería Palace): A must for all tourists that arrive in Saragossa is to visit the stunning Aljaferia Palace, which is really the most visited historic site in Saragossa. This medieval Islamic palace was built by Muslims on the banks of the river Ebro in the 11th century. – The Expo 2008 Zone: In summer 2008, Saragossa received the international exposition Expo Zaragoza 2008, which was placed aside the shore of the Ebro River. Currently, the Expo Zone is open to all the visitors who want to see the area and enjoy its activities. – Parque Grande: It has more than 15 fountains, a botanic garden, balconies, many terraces, paths and statues, a swimming pool and many more activities to do. 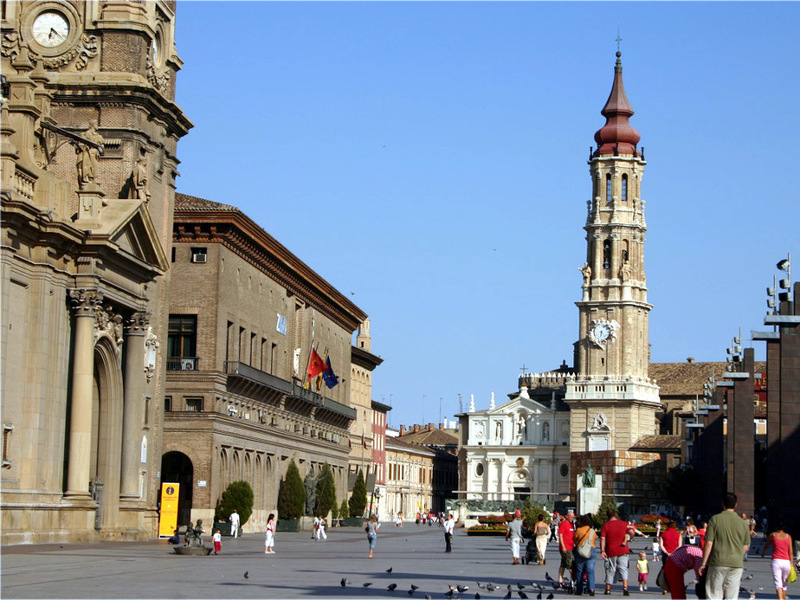 – Paseo Independencia (Independence Avenue): The main street of Zaragoza. Beginning at the end of Gran Via, the avenue runs from Plaza Paraiso all the way to Plaza España. 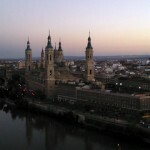 Read also Two-days tour in Zaragoza, the most visited places in Zaragoza and the best destinations of Spain.